Established in 2015, BioPhilly's mission is to promote the important link between human health and the meaningful daily experience of wild and bio-diverse nature in the city. We engage with our fellow citizens towards an urban habitat tapestry from the Delaware to the Schuylkill River. 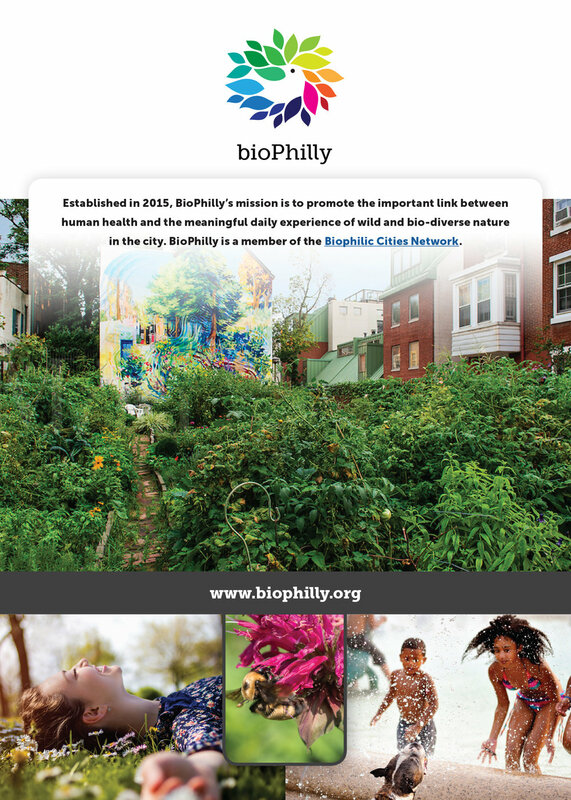 BioPhilly is a member of the Biophilic Cities Network. We join with a growing number of Biophilic Partner Cities from Washington DC to Singapore. • Promote the important links between human health and meaningful daily experience of wild and bio-diverse nature in urban Philadelphia. • Build the paradigm of re-imagining Philadelphia as a healthy and safe ecosystem, where a diversity of species, human and non-human, can sustainably thrive together. • Catalyze collaborations, providing biophilic urbanist expertise and support for groups and projects, which promote caring for place and foster a verdant and livable city. • Advocate for policies, which incorporate biophilic solutions and values. BioPhilly is a member of the International Biophilic Cities Network. the biophilic city is physiologically restorative. Daily joyful engagement with urban wild nature amazes, stimulates, and propels curiosity, exploration, play, learning, wonder & joy. Deep place engagement, commitment & stewardship enhance civic life: caring for place is an essential ingredient in caring for one another. biophilly seeks to build bridges between the design, construction, public health, government, and educational sectors towards our shared goal of biophilic stewardship for bio-diverse urban habitats, human and otherwise. Together we will invigorate the rewilding of Philadelphia towards a contiguous tapestry of bio-diverse and restorative urban habitats.